Rocket Rush is the fortieth level in Donkey Kong Country 3: Dixie Kong's Double Trouble! It is also the fifth area of Krematoa. In the game's Game Boy Advance remake, it is instead the forty-sixth level of the game, due to the addition of Pacifica. All 85 Bonus Coins are required to access this level; as such, there are no Bonus Areas in this level, thus making it the only level that has an exclamation mark at the end of the name before getting all the Bonus Coins (with the exception of the Game Boy Advance version, as an exclamation mark does not appear at the end of a level's name when the player gets all of the Bonus Coins in it). It is the final non-boss level of the game. The Kongs must navigate this cliff side level in a special Rocket Barrel. For the first half, they must descend to the bottom, collecting fuel so that they do not run out and crash. For the second half, they blast up the other side of the cliff, trying to reach the top without running out of fuel. Buzzes are the only enemy here, and in the Super Nintendo version of the game, both Green and Red Buzzes can be defeated by coming into contact with them. The Game Boy Advance version is significantly different than in the original version. Unlike the Super Nintendo version, Buzzes can damage the rocket, and the rocket can take two hits before exploding. To defeat Buzzes, the player has to hold A to brake and burn them with the exhaust fire, or the player can burn them with the fire made when turning left or right. Red Buzzes, however, cannot be defeated. Additionally, the controls for the Rocket Barrel are slightly different. In the original version, holding left would make the Kongs travel to the right, while holding the right button would make them move left. This was switched around in the remake. The Star Barrel is also absent from the level in the Game Boy Advance version. 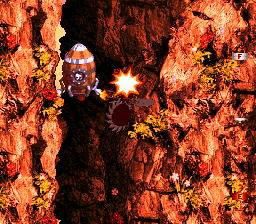 When the level begins, the Kongs find a Rocket Barrel. They jump in to find themselves hovering downwards. With limited fuel, the Kongs gain speed and maneuver around a few Buzzes, as they follow a banana trail and grab the letter K. Heading into a narrow passage, they encounter more Buzzes, along with a Fuel Barrel. They will enter a small area, where they travel diagonally and head into another narrow passage. Once they get through the passage, they hover through a small space. Another small opening is at the bottom of this small area. They go through it to enter a larger area, where they find another Fuel Barrel. Continuing downwards, they come up to a diagonal pathway, surrounded by some Buzzes. The Kongs fly between the Buzzes and curve into another path. There, they find several Buzzes flying across the area, as well as a Fuel Barrel. They also find the letter O here. Once the Kongs exit this area, they make several twists and turns through the rest of the path. Eventually, they find a small gap in the ground. At this point, the Star Barrel can also be found, though only in the Super Nintendo version. Falling into the small gap, the heroes grab some more Fuel Barrels and hit a barrel with a flame icon on it. This barrel causes the Rocket Barrel to move upwards. With progressively faster speed, the Kongs rush upwards, taking a different route than the one they traveled down before. If the Kongs hit a wall, they lose a great amount of fuel. Using banana trail to guide them, the Kongs soon head past the letter N and begin to travel through thinner passages. There, they will be able to exit the rocket and find the Level Flag. DK Coin: Just before the flagpole, the Kongs can find a Steel Barrel. They can carry this barrel to the left to meet the Koin, who will have the DK Coin, on a high ledge. If they throw the barrel above the Koin, it will roll against a wall and bounce back, defeating the Koin. K: SNES: Obtained by sticking to the left after departing on the rocket barrel. GBA: In a narrow area of the route down after some Red Buzz. O: To the left side of a succession of Buzz enemies. N: In the route ascending the cliffside. G: SNES: Right before the end of the level, may not appear at all due to a programming oddity in certain cartridges, however is always present in the Virtual Console re-release. GBA: It is found by sticking to the left side of the route beyond two Banana Bunches. In the Game Boy Advance remake, it is possible for the player to do a glitch which will make the Kongs fall off the screen in the Rocket Barrel. Gameplay can only be continued if the player exits the level or if the player turns off the game. This is one of two levels where both Dixie Kong and Kiddy Kong do their crying and tantrum on-screen at the same time if the player fails it. This page was last edited on April 10, 2019, at 13:55.